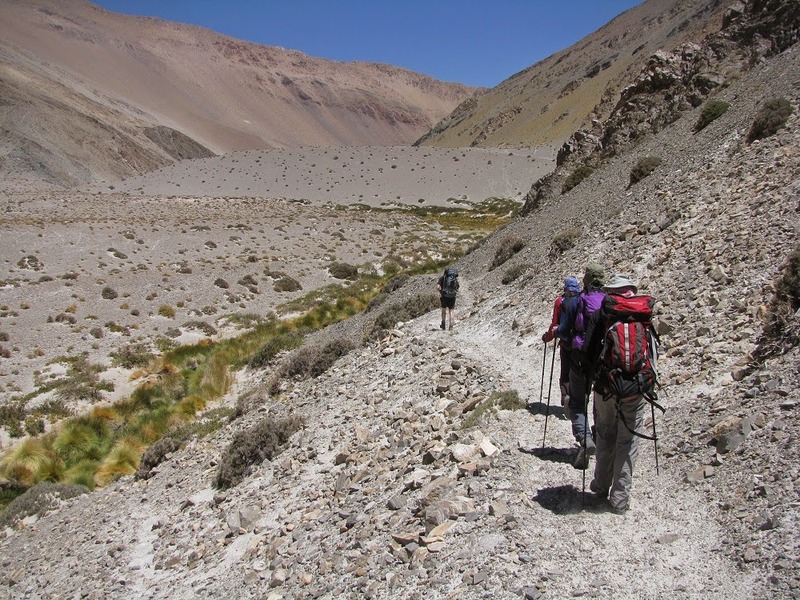 This is part 16 of a 31-part posting of my journal entries and photos from one of the greatest experiences of my life so far--a month-long mountain climbing trip to the Atacama Desert area of northern Chile and Argentina, which included summiting three 6000 meter peaks (~20,000 feet). To view all the entries in this series, check the posts labeled South America. I slept well, though slow to go to sleep at first. I got up at 6:55 to find a nearly overcast morning with a temperature of 47 degrees--yesterday PM and evening had been quite stormy with showers in the hills and mountains. Clearly a strong (for the season) front came through up from the south with a steady south wind this morning. I caught up on my journal then just rested for a few minutes. Everybody started stirring around 7:30--they made oatmeal and, of course, tea for breakfast. Then we began tearing down camp. After finishing with my tent and bags, I helped some others. Then we sat around and relaxed and waited for the transport to arrive. The driver arrived about 10:30 and drove the first four people and lots of luggage up to the entrance to the canyon out of which the river flows. I waited with the other three for the next pick up when the truck got back, about 11:15 or so. We were all delivered to the mouth of the canyon by 11:40. 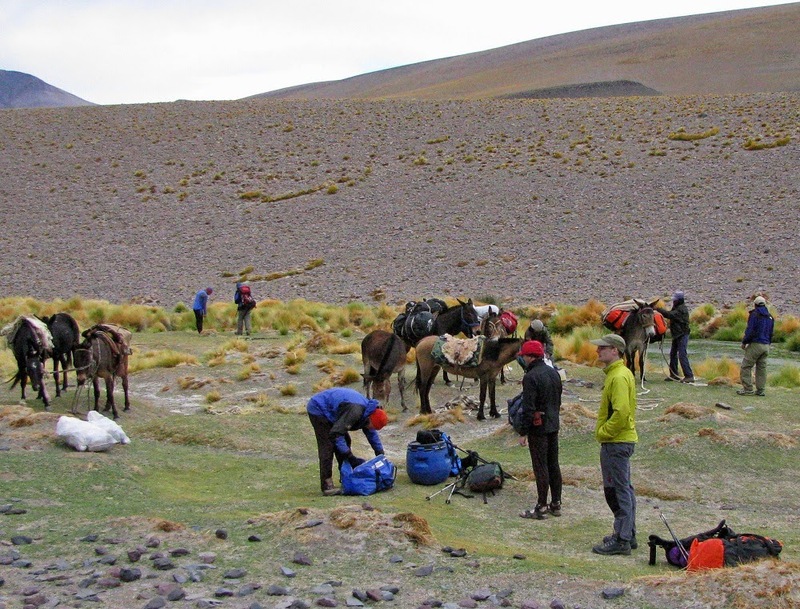 From there we'll have three days of trekking, mule supported, to our base camp. The mules and two arieros on horseback driving them were waiting there. They were to load up the mules and catch up with us, so we headed off around noon. We stopped at 1PM for lunch and about every hour after that. The valley was stark and picturesque. I took a few photos along the way. 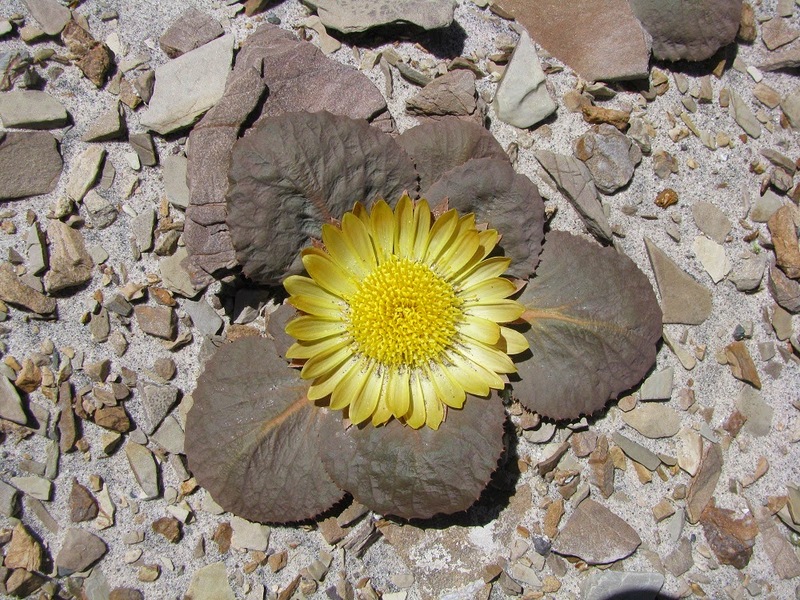 Here is a small, normally inconspicuous (if not downright camouflaged) plant with a spectacular flower. 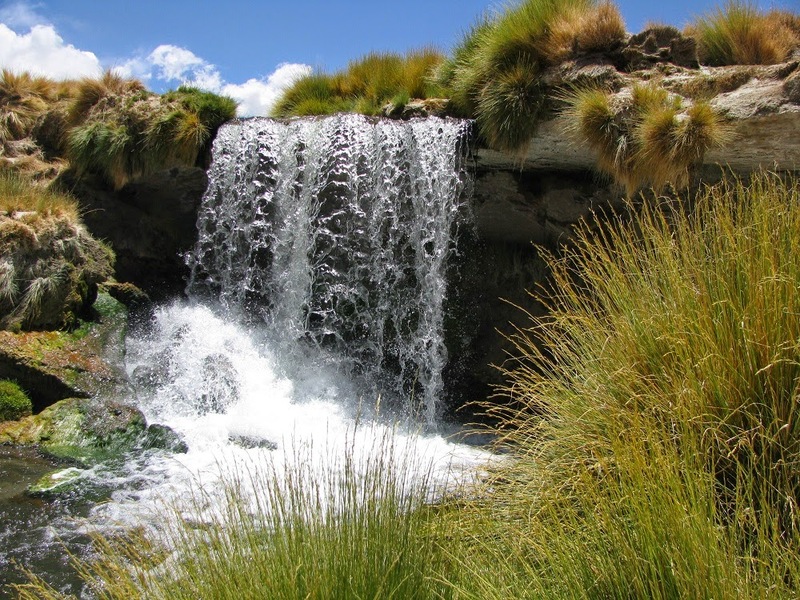 Here is a significant waterfall on the stream, but we barely stopped to look. 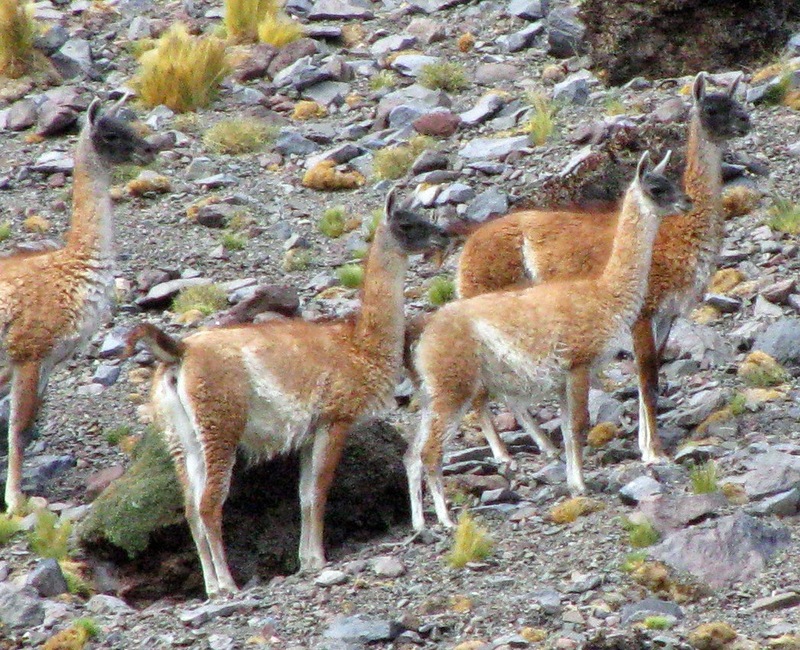 And finally, here is a zoom shot of some dark faced guanacos retreating up a slope. 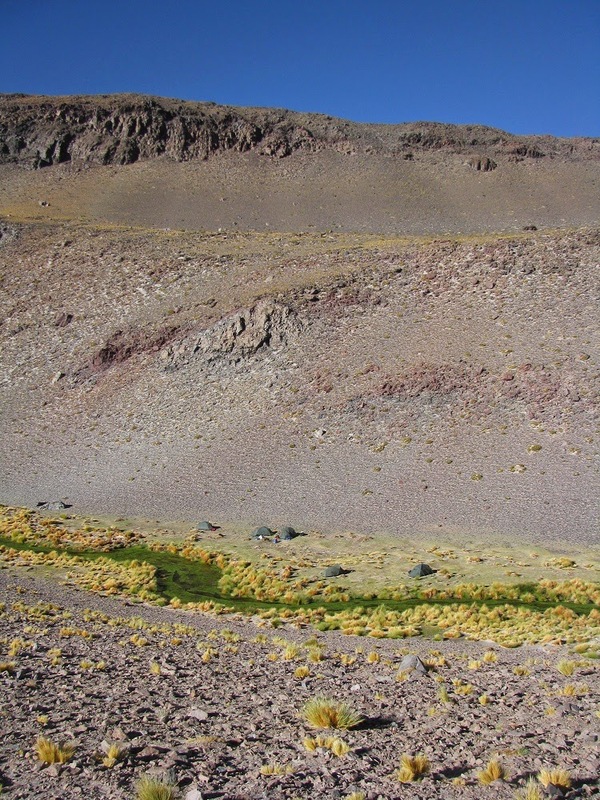 Some plants had pretty stout defenses against guanaco munching. 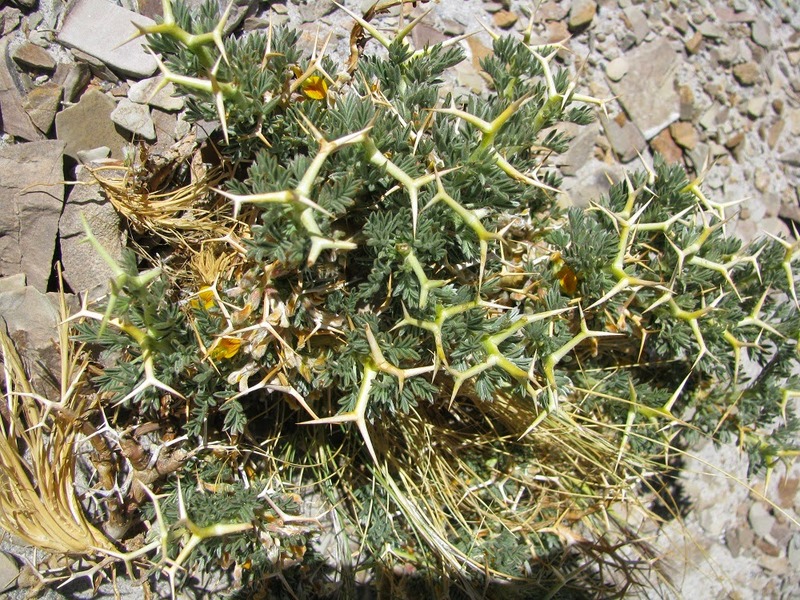 Note the yellow flowers. There was never any sign of the mules catching up. We got to the vicinity of our campsite around 6PM--a place called Aguas Calientes--and sat in the shelter of some rocks while waiting. 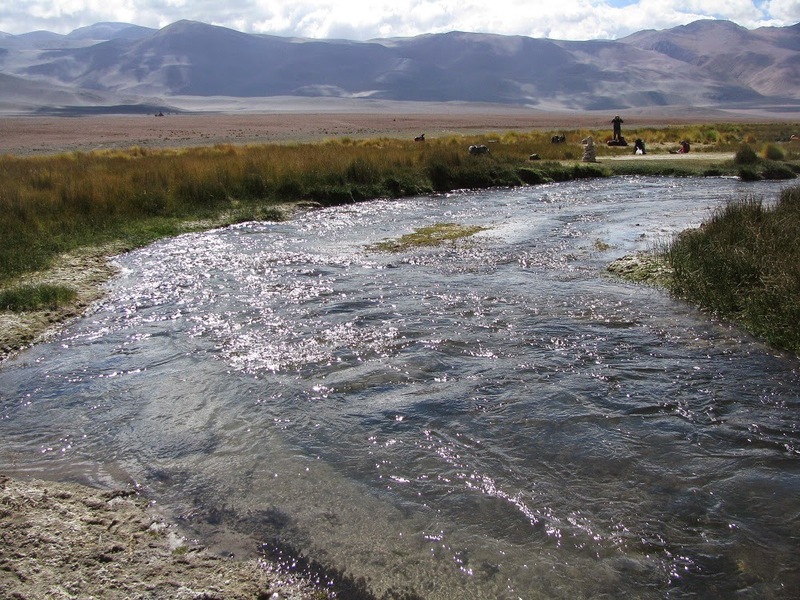 About 45 minutes later we got sight of the mules and moved on to our actual campsite where we had to wade the stream knee deep to get to the grassy area. We set up camp and had a good supper of ravioli, asparagus soup, tea, and a little chocolate cake. We cleaned up and I went to my tent and caught up on journaling while a few of the ‘die hards’ stood around outside until there was virtually no light--after 9:20 (which is when I finished my writing and got ready for bed). Everybody was in bed by 9:30.